We love harvest catch-all soup, but sometimes eating it endlessly in the winter gets a little old. 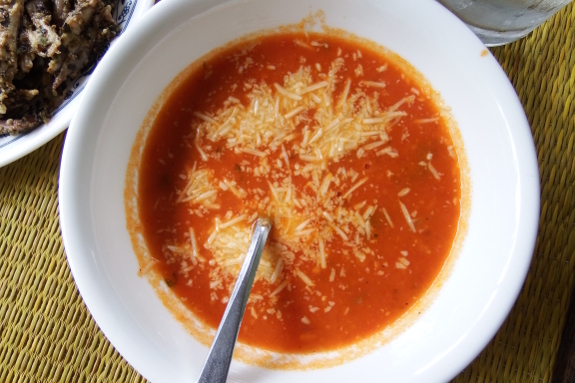 So I decided to expand our repertoire this year to include a second soup --- farmstead tomato. The soup is almost too easy to make. I cut tomatoes into large chunks while topping them and removing spots (leaving skin and seeds in), then squeeze the result with my hands to assist the break-down process. After adding the chicken stock, onions, and garlic, I simmer for about an hour and a half. 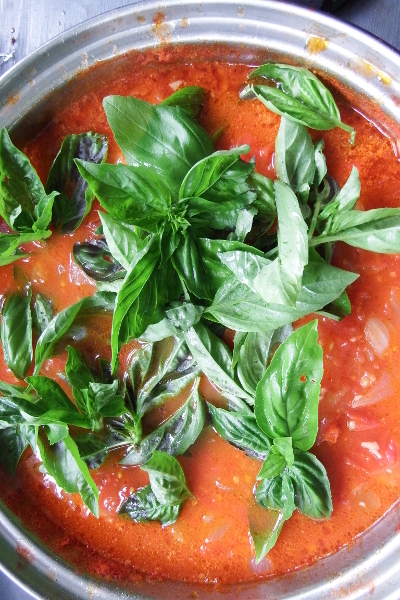 Then I cool the soup for about half an hour before adding the basil and blending it in well with an immersion blender. Finally, I pour in the milk and add salt, pepper, and a bit of honey (more sweetening if the tomato plants are blighted, less if they're not). The result is about a gallon of deliciously creamy tomato soup with every ingredient except the salt and pepper coming straight from the farm. Enjoy! Nice recipe. If you have a Hand Blender (immersion blender) then may I suggest the following: Boil water and throw the tomatoes in there until the skins start to separate. Immediately take the tomatoes out of the boiling water and throw them into ice water (if you have it) or cold water, to cool them down. The skins will peel off easily. Take the resultant mass and put them in a bowl and use the hand blender to puree the whole mess, seeds included. You now have tomato stock you can use for soup, sauce, whatever... and you can can it as well for future use. Save some from the freezer for me to taste for you!! Sounds marvelous! Jayne --- I'll definitely cook you up a pot while you're here next week. You may have to remind me, though. Looking forward to your visit! Would you suggest freezing this? Or would you freeze the soup minus the milk and then add it later? Looks wonderful.! !